Ted Baseler, CEO of Ste. 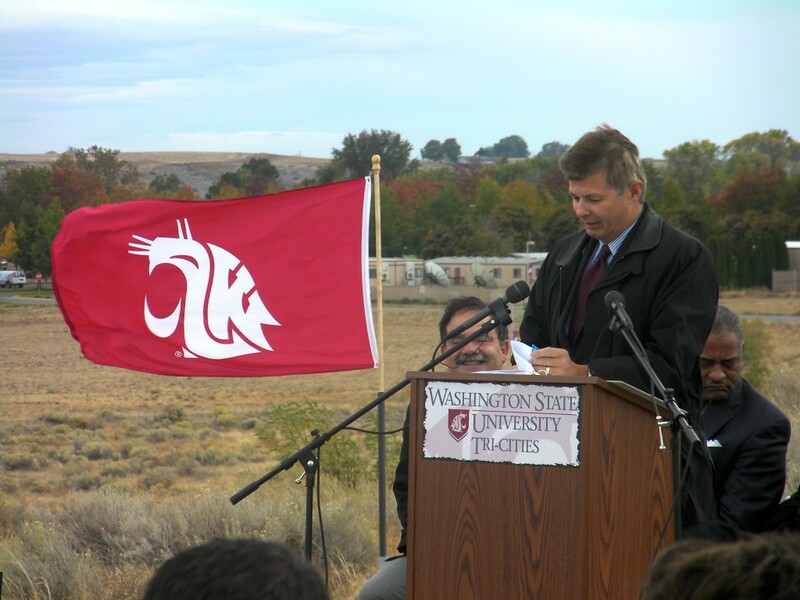 Michelle Wine Estates, addresses a crowd of 120 on a blustery October day during the dedication of the WSU Wine Science Center location in Richland. Washington State University‘s $23 million Wine Science Center continues to march forward, with the organization that will run its construction now seeking design-build proposals. The Wine Science Center will be built at the WSU Tri-Cities campus, in the heart of Washington wine country on a bluff overlooking the Columbia River and near a demonstration vineyard that is producing grapes as well as providing learning opportunities for students. The Wine Science Center Development Authority, operated by the city of Richland, seeks design-build proposals for construction of the center by Jan. 23. Construction is expected to begin before the end of 2013. This comes just two months after WSU, the city of Richland, the Port of Benton (which is donating the land for the project) and Gov. Chris Gregoire dedicated the site for the Wine Science Center. Already, $17 million has been raised, enough to get construction going. The Washington Wine Commission got fundraising revved up in mid-2011 by pledging $7.4 million. That was followed in February by a $1 million donation by Ste. Michelle Wine Estates – Ste. Michelle CEO Ted Baseler is chairman of the fundraising committee and sits on WSU’s Board of Regents – and another $5 million from the state Legislature during the spring session in Olympia. In October, Gregoire ceremonially signed over the $5 million. That same day, Spokane Industries pledged $600,000 in stainless steel tanks to the Wine Science Center. About $15.25 million is needed to build the Wine Science Center, and $12.4 million has been raised for construction, while another $4.1 million has been designated for equipment. The land donated by the Port of Benton is worth $350,000, and another $150,000 worth of architectural and design services has been donated by Terence Thornhill of Pasco. If all goes as expected, construction will begin by fall 2013 and will take 12 months. The Wine Science Center will include a working winery, and it is conceivable that students and faculty could begin crushing grapes there during the 2014 harvest. The Washington wine industry is worth $8.6 billion annually to the state and $1 billion per year in Benton County, where the center will be built. Benton County makes more wine than any other county in the state, thanks to such large producers as Columbia Crest, Hogue Cellars, Chateau Ste. Michelle and Barnard Griffin. Across the state, the Washington wine industry keeps 27,000 people employed – 5,200 of them in Benton County.